Art on a tight budget? When you look at the image below, you'll notice that we didn't apply the light diffusion filter yet. The window in the house is crisp and bright. 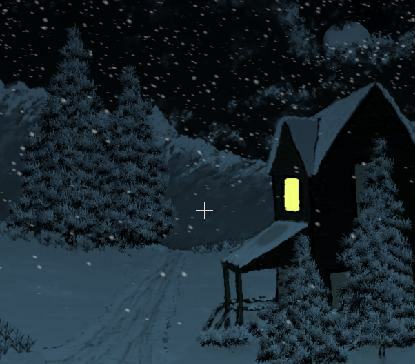 However, you might expect some of the snowflakes and immediate surrounding air near that lit window to also be brighter. We'lll explore a few tricks and ideas to make it so. Using the lasso selection tool in the Alpha tools group, like we did in earlier parts of this tutorial, you can 'draw' a rough quick selection of the zone that should be affected by the light from the window. Imagine a cone of light starting by the window and spreading at wide angle to the left. That selection would be too crisp and precise for a gradual brightening of the air and snowflakes inside that cone. We need it more subtly changing from outside and inside the cone. Make it a very high blur value, why not all the way to the max, and perhaps even apply it a few times for further bluring. Remember that you can use the ALpha>Store-alpha option to take a quick peek at the result in alpha space as a greyscale image. The goal of this cone shaped alpha mask is not to totally block the rendering of snowflakes which are outside of the cone. We'll still expect the flakes to be visible, just at a diminished intensity or brightness. You should thus adjust the alpha, by brightening it to the point that the area outside of the cone is not totally 'off' but still has perhaps a 50% selection value. 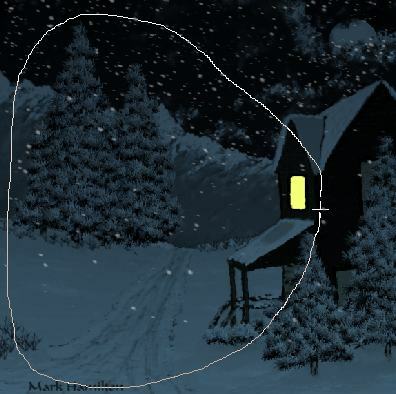 This will help ensure that the snow flakes brighten up inside the cone, and darken outside of it but still remain seen. 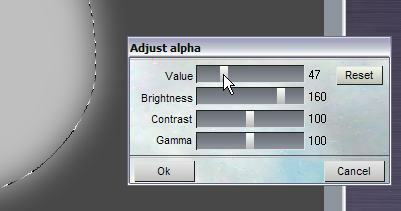 Use an increased value for the Brightness slider, and a decreased value for the Value slider to prevent it from going too bright. Not that it matters too much.Just a thought. You can also use the Contrast value slider. 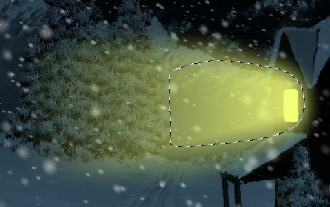 The ideal is that the area inside the light cone is near the maximum bright white value (i.e. 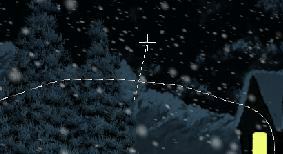 fully selected or enabled in alpha-lingo), and the area outside would be at mid grey, for partial selection of those pixels. This mask becomes weighted mask of sorts. 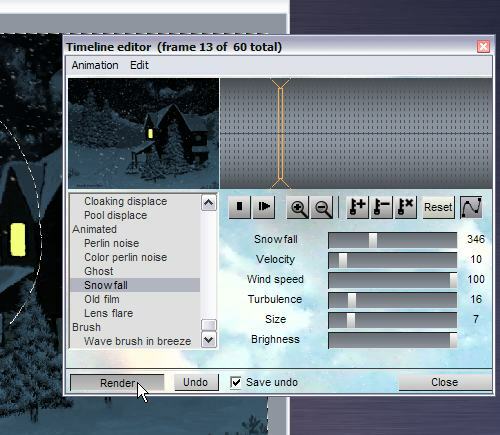 Render another pass of the snoflakes filter in the Timeline now. Don't use too many for the snowfall count parameter. 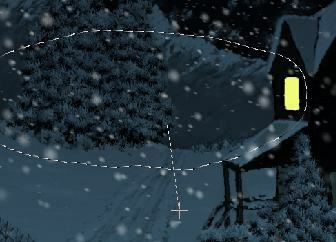 Use average to large size (these are relatively close-up flakes), and bright intensity. 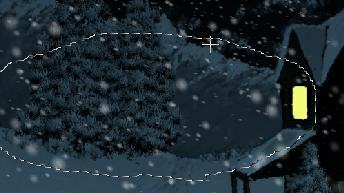 Even in the small preview thumbnail you should notice that more bright snow is appearing 'in front of the window'. Now we'll add some brightening, in another cone coming from the window again, but this time the brightening should not just apply to the flakes passing in front. This brightening will apply to the mass of air in front of the window, to simulate volumetric air moisture or fog scattering the light. The farther away from the window you look, the dimmer the scattered light will be, until it fades to normal darkness near the left edge of the image or wherever you deem appropriate. Use the lasso selection tool again like before. This time perhaps a more elongated light cone? Select the Linear Alpha fader. 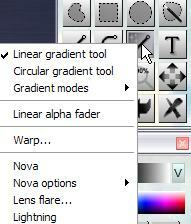 It is one of the tools in the Linear tools collection: right-click on the linear tool (or line tool in version 3 of PD Pro and earlier), so you can see the popup menu which includes linear gradient, circular gradient and other tools like Nova, lens flare, lightning,... which all have some form of linear or curvi-linear element in their application. The linear alpha fader applies a decreasing gradient of alpha values in the direction that you draw the line. You start with a click-and-drag inside the cone for example, such as near the upper edge of it, where it's still fully selected and should remain so. You keep moving to the top and outside of the cone selection and release the mouse button aobe that. Do another from the mid-bttom downwards. 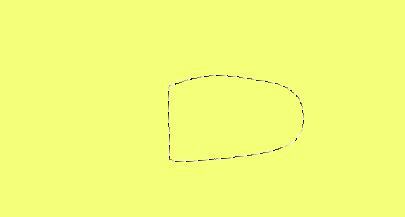 Note that you can draw them at a slight angle too, in order to 'open up' the cone on the left side. and tighten the alpha grip to the right side. And you can do this more than once to gradually chip away at the original, crisp cone. The final and perhaps most important use and application of the linear alpha fader will be the one controlling the fading of the lightcone as a result of the distance from the window. Start at or near the window, perhaps even slightly on the right side of it. Drag the linear alpha rubberband to the far left and left go. The linear alpha fader is a multiplicative operator: it multiplies the fading alpha values from 255 to 0 (or 1.0 to 0.0 in a normalized sense), i.e. white to black multiplied to the current alpha values. It is thus cumulative if you apply it several times. After just one application across the length of the cone it may look like this in alpha: half of it may appear gone. But don't be alarmed or misled: the marching ants only show the location of the 50% threshold. Thus the seemingly sudden dropoff at the leftside vertical line is not actually an abrupt border of alpha selection. 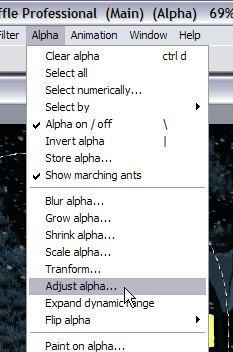 You can in fact use 'Store alpha' to verify the result. It should look like a code that's fading to the left since we draw the linear alpha fader right-to-left. With that gradual, fading alpha mask in place, we can now use it in several ways. If you're working on just one image, use the erase tool with the right button and select Clear selected to primary or secondary, whichever holds the color you want to erase into the mask of the fading cone. 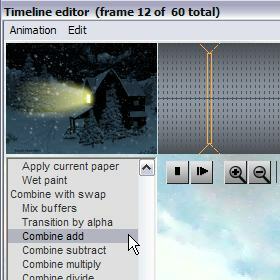 You can also 'fade last action' (Filter menu) if the erase effect is too intense just by the window. If the color used for clearing was a light yellowish tint, you'd get something like this now. For the animation, let's instead use the swap buffer to carry the color (or multiple colors) that we'll combine over or into the images from the animation's frames in the main buffer. this filter will combine the colors of the pixels from the swap buffer and the main buffer, frame by frame. The color from the swap buffer will be added to that of the main buffer. The effect is modulated by the alpha mask, so the resulting effect fades away to the left. 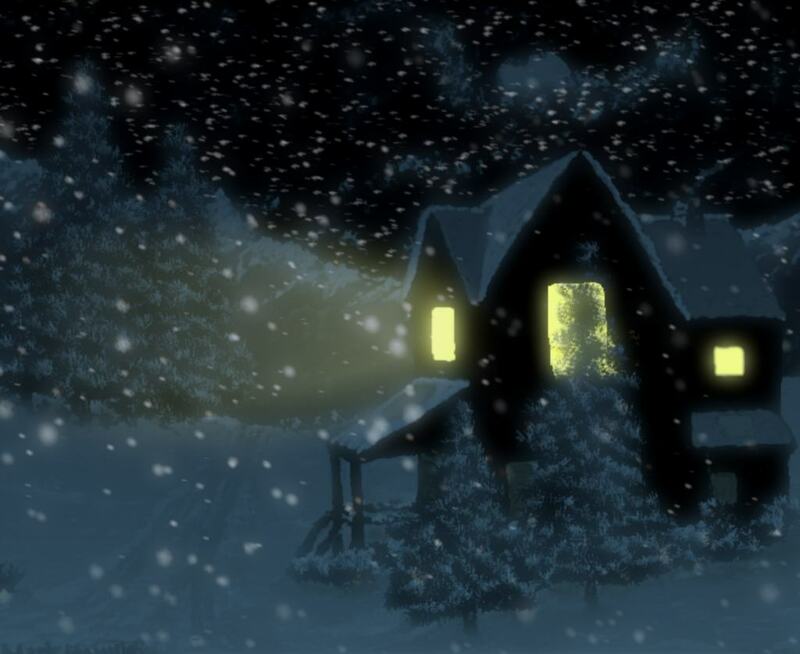 Plus, if there are bright snow flakes whisking bye they will brighten up even more while in the fading lightcone. This looks good but perhaps a bit too intense. and bring the brightness and/or value down to 50% or so. Below is an image resulting from this new application with a dimmed alpha mask. The 'volumetric' light cone is more subtle. I've also added light diffusion, and prior to that also added lights to some of the other windows.